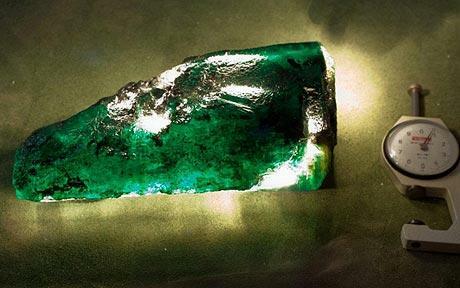 The world's leading manufacturer of gemstones, "Gem Mine" announced that they are discover one complete weighing 6225 karats emerald stone that located in Zambia's Kagem mine accidents in 22 Feb. The report quoted, "Gem Mine" company spokesman as saying that this huge piece of jade stone was discovered at a daily mining operations surprised in February 5 this year, at present, the relevant experts are make detailed argument on the purity and value of the jade stone. "Gem Mine" chief executive officer Ian Harebottle said that this is an amazing discovery, the entire ore shows wonderful translucent colors and good shape. Its great shape, dazzling colors and excellent protective shell so that it is hard to spy on the secret hidden. He also revealed that all the signs shows that the purity of the block jade stone is very high, it will be able to produce a large number of high-purity cut emeralds. It is learned that the world's largest jade ore in 1974 in a mining area in Brazil was discovered, and this incredible weight of 86,136 karats of natural green columnar crystals worth 1.128 million U.S. dollars.